The most often types of skin cancer are (actinic keratoses (premalignant)), squamous cell carcinoma (developing from actinic keratoses), basal cell carcinoma. If lesions persist more than 3 months, a malignant process should be considered. The diagnosis of skin cancer can be done by removing part or all of the skin lesion and examination of cells under a microscope (biopsy). Histological examination is the basis for the diagnosis and treatment of skin cancer. The treatment of small localized basal cell carcinomas can be done with cryotherapy, by spraying with liquid nitrogen. 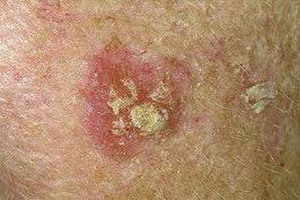 Small lesions may respond to topical treatment with antineoplastic agents such as imiquimod cream (aldara) or 5 fluorouracil. Most large tumors or cancers that have recurred should always be removed surgically and examined under the microscope. In large tumors occupying a large area there may need skin graft placement in the exclusion of the lesion. Neglected and extensive tumors in elderly patients may require radiotherapy.